1: The customer/cardholder places an order and submits the credit card details for payment through an eCommerce webstore, the information is passed through the secured payment gateway via SSL-encryption to the merchant’s web server. 2: The payment gateway now transmits the payment transaction data to the payment processor used by the merchant’s acquiring bank via a merchant account. 3: The payment processor (via the merchant account) transmits the data to the card issuer. 4: After the card association determines the approved or declined status (depending on the type of card used and issuing bank), the payment processor (again, via the merchant account) receives a response code with either an approval code or a denial code with reason (e.g., insufficient funds, network not available, etc.). 5: The payment processor, via the merchant account, sends this approval or denial response back to the payment gateway. 6: The payment gateway completes the cycle and sends the response back to the customer/cardholder that is patiently waiting at the merchant's webstore and completes the checkout process. The Payment Gateway primary role is to protect the cardholder during an eCommerce transaction. It is provides a secured layer when the cardholder or customer makes the initial request to perform a payment transaction. It facilitates the transaction authorization by encrypting the transaction details and then passes it through the merchant’s web server. The processor then sends the information on to the card issuer for approval and the approval response is sent back to the merchant via the payment gateway. It is the e-commerce equivalent of the physical POS terminal used by store-front merchants in face-to-face transactions. 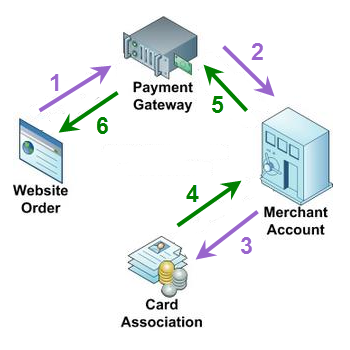 A Merchant Account is a service that allows the merchant to accept electronic payments i.e. credit cards, debit cards, ACH, etc This service is provided by a processing bank that is a member of a credit card network (such as VISA, MasterCard, Discover, American Express), either directly or through a third party. It links all the transaction components into an inter-related system. Once a payment transaction is processed, the processing bank credits the merchant’s designated bank account for the transaction amount, after it subtracts its processing cost, as agreed on in the Merchant Agreement. The processing bank then sends a payment request to the card issuer, who credits the processor’s account, after it subtracts its own costs. The issuer then sends a monthly statement to its cardholder to complete the cycle. So there you have it Credit Card Payment Processing debunked :). Stay tuned...next article we will give an example of how fees are calculated.